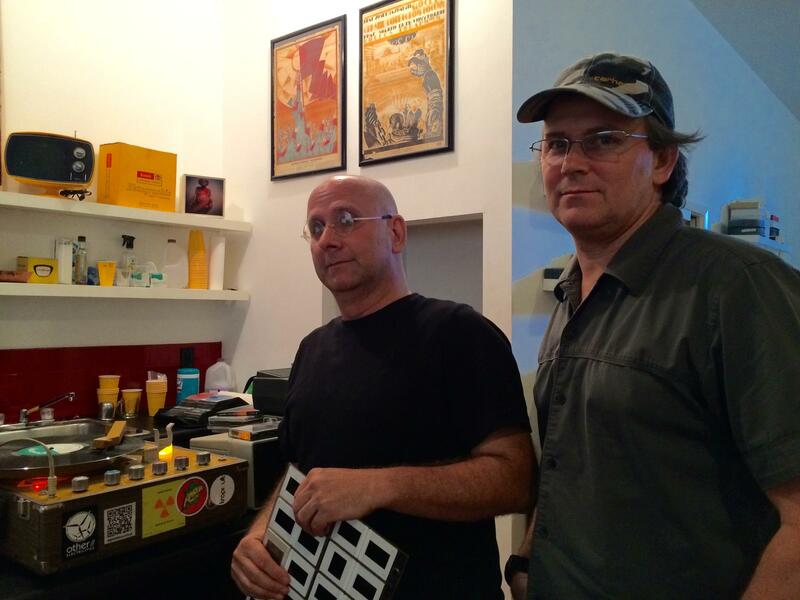 Barron Sherer feeds 16mm film into a projector at Miami International Airport. 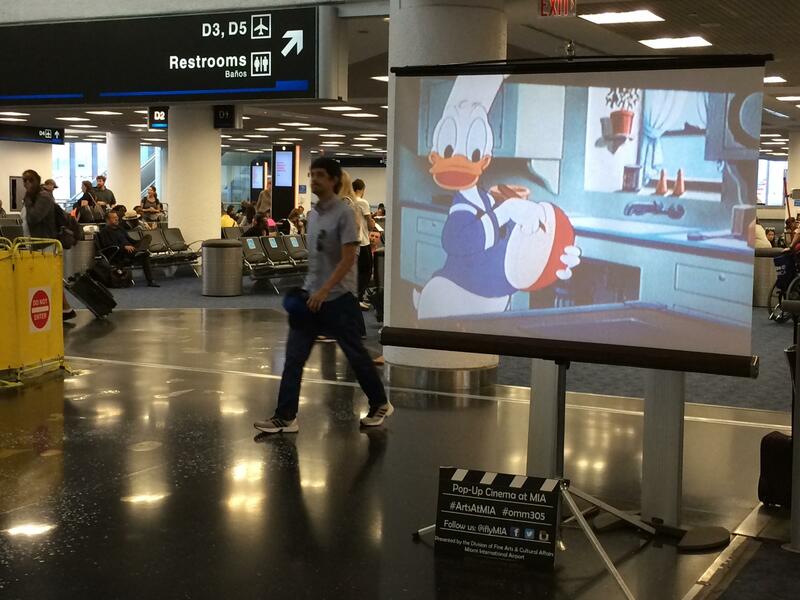 Obsolete Media Miami screens cartoons at Miami International Airport. The guys feeding the tape into the projector are Barron Scherer and Kevin Arrow. Together they make up Obsolete Media Miami, or OMM, a shared studio space and repository for all kinds of old media, primarily slides and film. “I've been trying to figure out [what to do with this stuff] now for 30 years,” says Arrow, who, in addition to starting OMM is art and collections manager for the Miami Science Museum. 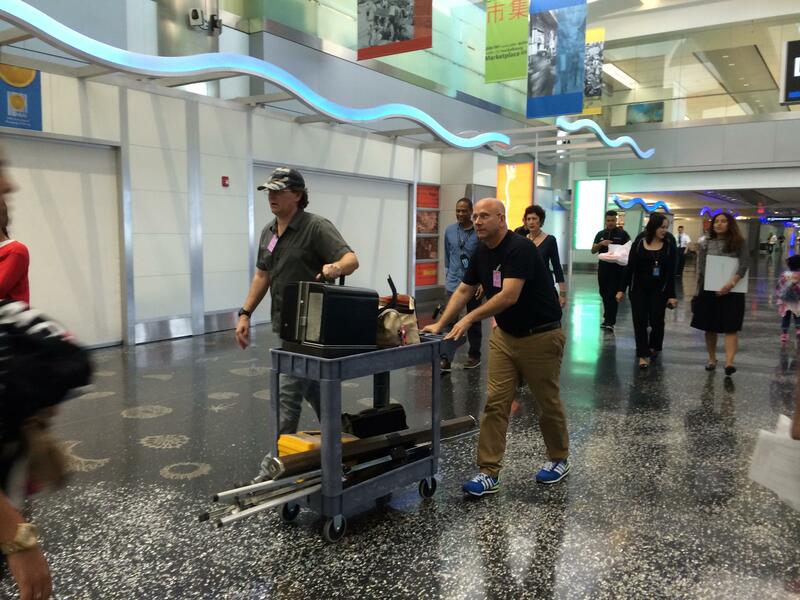 Arrow and Sherer cart their 16mm projector through Miami International Airport. In the 1980s, Arrow did interior projections for South Beach nightclubs and has since moved his work into art galleries. At the OMM studio in Miami’s Design District, there are stacks and stacks of slides that people have given him: of Miami in the 80s, old family photos, NASA images from the 1969 moon landing and thousands of others. Sherer is the other half of Obsolete Media Miami and focuses more on film. The Obsolete Media Miami studios in the Design District. And while preservation of media in these “obsolete” forms is part of the mission of OMM, using it for art projects, like screenings at the airport, is the primary goal. For them, the still and moving images are like paint in a tube, raw material to make something new. And they invite other artists to come and do the same. Other projects include a screening of home films without the sound and inviting a local noise musician to score them live. Another, for the upcoming DWNTWN Art Days will showcase a collection of slides and film of art and artists from Miami’s history. Kevin Arrow, left, and Barron Sherer, right, in the OMM studio. OMM is gearing up to hold workshops for people who want to learn about super 8 mm film and film-less filmmaking. 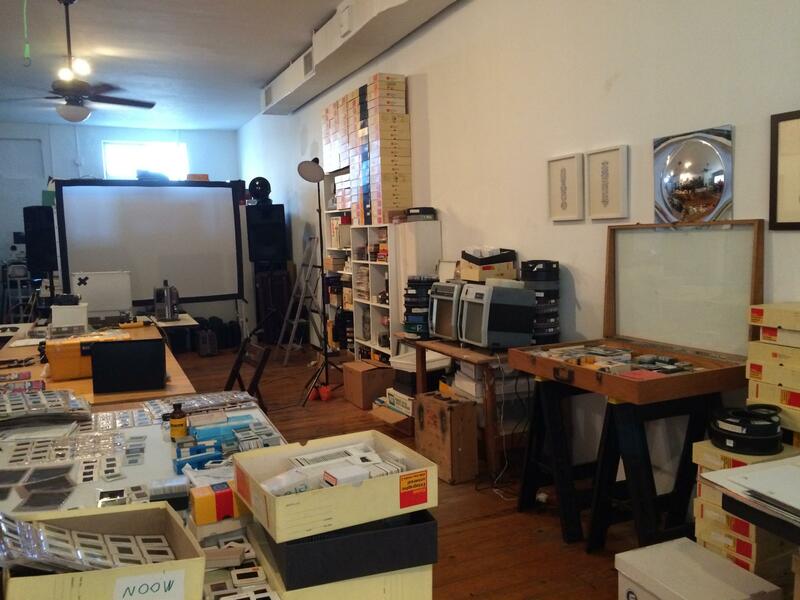 Obsolete Media Miami’s DWNTWN Art Days show will be at the Miami Center for Architecture and Design Sept. 11-13. This is a story about a mermaid. A vigilante-environmentalist mermaid, and she can't stay quiet any longer. She needs people to stop polluting South Florida’s waters. “She’s the daughter of the goddess of the sea known as Yemaya in Cuba and the Caribbean,” says Elizabeth Doud. In her one-woman show, Doud transforms into Siren Jones, the mermaid. The American Black Film Fest has announced its return to Miami Beach for its 20th anniversary next year. Originally envisioned as a destination event, founder Jeff Friday says the festival may be ready to settle down here. Friday cited Miami’s “culture, logistics, and accessibility” as fitting the needs of the festival’s community, and as the main reason for his decision to choose the city as a permanent home.